Special Notes: Also known as The Lost Lucy-Desi Christmas Special. On Christmas Day, 1959, The Desilu Playhouse presented a special Christmas broadcast starring the whole I Love Lucy gang. Special Notes: This special was written as a way to capitalize on Lucille Ball's Broadway success and keep her on television at the same time. The special was cancelled because Lucille was ill.
Special Notes: This is an adaptation of Sherwood Schwartz' play, "Mr. and Mrs." Lucille Ball hired Jess Oppenheimer to adapt the play as a TV special. This was the first time they worked together since 1956 when he left the set of I Love Lucy. Special Notes: This was based on an episode of The Lucy Show called "Lucy Goes To London," which aired on October 17, 1966. It is considered as a continuation of that episode as an hour-long special. This was the first time Desilu filmed in a foreign location, paving the way for other shows to follow. The first choice for filming was in Paris but was later changed to London. The song, "Lucy in London", written by Phil Spector and performed by The Dave Clark Five, is presented as a vertable music video with Lucy in a long red wig and wearing the latest in mod fashions. Special Notes: This Carol Burnett special was only one of two produced just months before her long-running variety series, The Carol Burnett Show (1967-1978). In the sketch where Carol Burnett and Lucille Ball play cleaning women, you will notice a picture of Vivian Vance hanging on the wall of the movie studio office..
Special Notes: This was Lucille Ball's first special since Here's Lucy ended in it's sixth season. Lucy and Art Carney had previously played husband and wife in 1967s comedy, "A Guide for the Married Man". Arnold Schwarzenegger makes his American television debut as the overly muscled masseur Rico. Special Notes: "The Dean Martin Celebrity Roasts" evolved from the 1970's variety series in which Dean Martin negotiated one of the largest contracts for that time between a network and a star. Several of these shows were "roasts," set at a banquet table, in which the guest of honor was showered with insults by other celebrities. It was eventually spun off into a series in 1975 with Martin acting as "Roast-Master" and continued until 1984 where it was a fixture on the NBC Thursday night lineup. Special Notes: Dean Martin had previously appeared in an episode of The Lucy Show, "Lucy Dates Dean Martin", which was Lucille Ball's favorite episode. Special Notes: Lucille Ball previously worked with Jackie Gleason in the Here's Lucy episode, "Lucy Visits Jack Benny". Special Notes: Lucille Ball does a good job in an extended "solo" scene where she depicts her character's acute fears regarding her upcoming life as a single woman. Special Notes: This special was more or less, a bittersweet Lucy Show reunion as it featured most of the regulars from that show. This was also the final appearance of Lucille Ball with Vivian Vance. Vivian had already been diagnosed with Breast Cancer and was receiving chemotherapy treatments and had suffered a stroke, which left her face partially paralized, just a few months prior to filming this special. This was also the last time Lucille worked with Mary Jane Croft and Mary Wickes. Lucy had also just lost her mother, DeDe four months prior to the shows airing in July 1977, and was visibly distraught at her mother's absense in the audience. 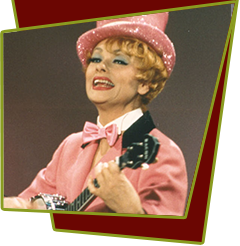 Special Notes: The Nashville Philharmonic skit comes from The Lucy Show episode, "Lucy Conducts the Symphony". Special Notes: After nearly thirty years at CBS, Lucille Ball dissolved her partnership and switched to NBC, which was scandalous at the time. NBC was willing to allow Lucy to produce new programs starring actors other than herself. Although promising, it only resulted in this one special and several guest appearances on Bob Hope specials.